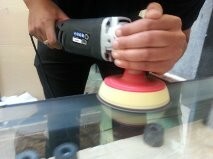 For use with Scratch UK dry abrasive glass scratch removal products. Supplied in a 250 ml tub and provides the ultimate finish and luster. For use with Scratch UK dry abrasive glass scratch removal products. Supplied in a 250 ml tub and provides the ultimate finish and lustre.